While many are hoping to see a larger-than-usual view of the Moon this weekend, here’s some great 3-D closeups courtesy of the Lunar Reconnaissance Orbiter and imaging wizard Nathanial Burton Bradford. 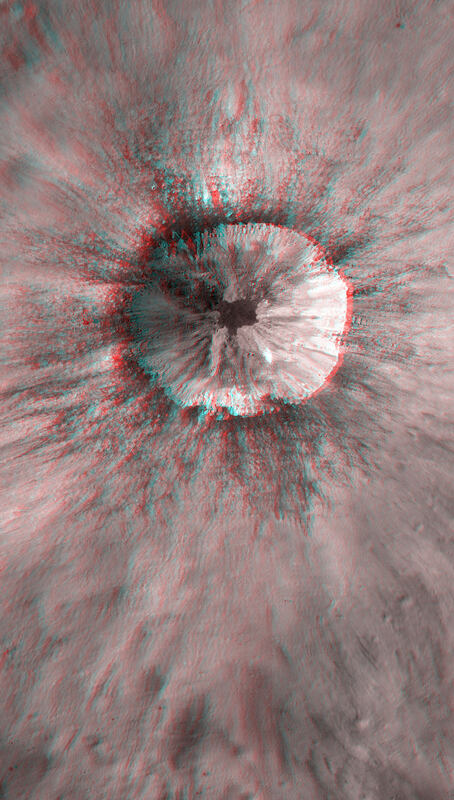 This great 3-D view (Red/Cyan glasses needed) shows quite an interesting young impact crater on the Moon, (17.682°S, 144.408°E) west of Isaev crater. Click on the image for a larger view, and in 3-D you can dive right in and see all the nooks and crannies – what scientists call complex crater morphology. Below you can view a Digital Terrain Model, or DTM of this same crater, and find the specifics of how deep the various parts of the crater are and other information critical to scientific investigations of the Moon. Digital Terrain Model (DTM) of an unnamed crater in the farside highlands. Image is 3.2 km across. Credit: NASA/GSFC/Arizona State University. 3D anaglyph of rim impact melt deposit on Unnamed crater on nearside highlands (38.112°N, 53.052°E; northeast of Mare Tranquillitatis). Credit: NASA/GSFC/Arizona State University; anaglyph by Nathanial Burton-Bradford. Ostrach says that LROC images show that impact melt is widespread and quite common to lunar impact craters — but as this image shows – take a close look to find channels, flows, and veneers across much of the region. Impact melt started to flow back into the crater cavity before it solidified. Image width is 500 m, from the LROC Narrow Angle Camera. Credit: NASA/GSFC/Arizona State University. Find out more about these recent LRO images on the LROC website, and see more of Nathanial’s photography handiwork at his DeviantArt page.